[T]he game is set in Florence, Venice and Rome over a number of decades leading up to the year 1499. The game’s producer-authors… labored lovingly to re-create the environs as exactly as possible. They hired Renaissance scholars to advise on period garb, architecture, urban planning, weaponry and the like. They took tens of thousands of photographs of interiors and streets. They used Google Earth liberally to piece together the ground-up and sky-down perspectives through which the action flows…. The hazy colors and the distant sound of river birds are uncannily correct. Nowadays, the tourist hordes can blot out all sense of history. 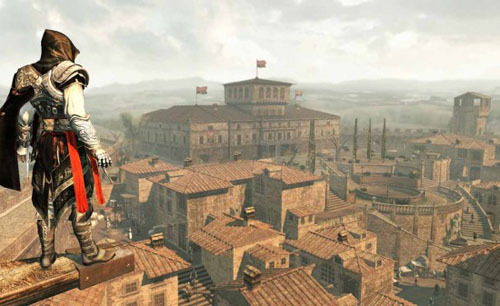 Once you’ve navigated it on AC2, when you visit the Ponte Vecchio in person the illusion persists of a highly intensified sense of place. In other words, the video brings the place sharply back to life. Recreating history comes at a price: the budget for the game is something north of $20 million. I hope that the publishers will find a way to put some of their investment to educational use; I for one would love to visit Renaissance Italy without having to assassinate people once I get there. Someday I hope to see a recreation of ancient Jerusalem this detailed, though I can’t imagine what kind of game could justify the pricetag. In the future, maybe the cost of creating virtual time travel will drop far enough to be within reach of small schools, companies, or individuals. You are currently browsing the OpenBible.info Blog blog archives for January, 2010.